Why is it that when you hear eye-witness accounts on Bigfoot and Nessie, it's always the chance encounter by the drunkard who just sauntered out of his local pub? It's never the guy who actually goes out looking for them -- like that determined scientist with grant money and expensive equipment? So when I accidentally stumbled across salteñas while aimlessly meandering through Tustin the other day, I felt like the former: the village idiot who just got lucky. Why? According to Gustavo Arellano, only two local restaurants serve this Bolivian take on the empanada. Fortunately, I had a camera on me, ready to snap a picture as proof of my discovery. So here it is: the third place in O.C. to serve salteñas. Of course, it's a panaderia. And although the classy digs of this week-old eatery won't allow the restaurant to call itself as such (its professionally-made sign reads: "Rollie's Bakery & Mexican Cafe"), it is one. 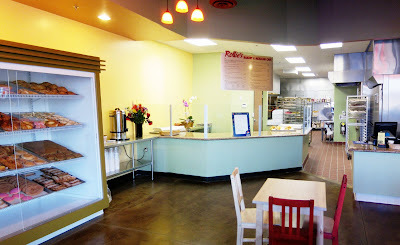 Inside you find the usual assortment of rolls and pastries. There are the predictable staples of conchas, spongy domes striped with compacted sugar; and unexpected things like custard-filled flutes rolled to be as thick as a Cuban cigar. All of this wouldn't be newsworthy in, say, Santa Ana or Anaheim, where you can throw a stick and hit a Mexican baker, but in Tustin, it's as rare as a sasquatch fart. In fact, if I am not mistaken, Rollie's is possibly the first real panaderia in the city (if you don't count the bakery inside the Bodega Ranch Market). And I haven't gotten started on those salteñas ($2.50 each). The tops of these airy puffs of pastry are braided to be ridged and arched, looking like the backbone of a mythical beast. Their insides are stuffed with ground beef, chicken, peas, chopped hard-boiled eggs and raisins. Crusty, steamy, and savory; it's everything a good empanada should be. Once you finish one, you debate ordering another. And another. But there are more savory goodies to try. For instance, they've also got a type of empanada that doesn't fit into the classic definition of one. The empanadas de queso ($1.25 each) are more like thick blinis folded into half-moons, sandwiching melted cheese, and dusted with powdered sugar. If you get one, eat it as soon you can: the ooze of the cheese congeals too quickly otherwise. If you want something more substantial, opt for the breakfast chorizo burrito (served all day) instead of the enchiladas ($5.00), which aren't anything special. These burritos may look small for something that's priced at $4.50, but it's deceptively filling. And really, how much salty, fatty, nicely gristly, surreptitiously spicy pork sausage and cholesterol-laden egg do you need? Okay, I admit: a lot. One can never have enough chorizo and egg, nor joints that serve salteñas. Looks like I'll be headed to Tustin soon, LOL. Wow Elmo! I have to say, I am wagging my tongue looking at the photos. Great job on that because it's really tempting for me to buy all of those goodies! Wow. It's hard to picture ground beef and raisins together. I guess you had to be there. Looks real good though. Nice pics. Maybe, its just me and I'm too tired to fully understand this review, but I'm kind of confused- is this place highlighted because the food is so good that it can rival what you'll find in Santa Ana and Anaheim or is it special because its rare to find something like this in Tustin? I noticed this place the other week upon exiting the pho place across the street. Now I'll definitely stop in! If you're a hankering for Bolivian saltenas, do! 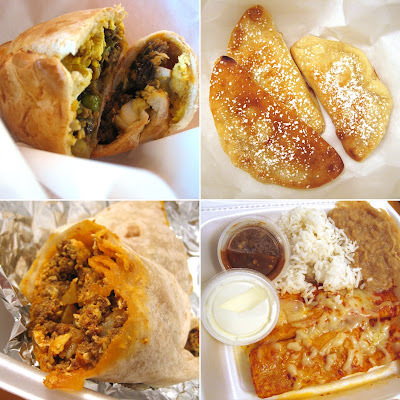 But if you want just the typical panaderia vittles, I bet there's one nearby in Chino. The conchas are the same as every other place that makes them. Something they call a cheesecake, really isn't...a bit too dense actually. But those custard flutes are pretty good. Most of the stuff is under a dollar too! True. I didn't think of raisins and ground beef being an odd match because I've seen it in Filipino cooking and also Indonesian. Personally I don't like raisins in general, but for some reason, I like them in savory foods, like these saltenas. No. 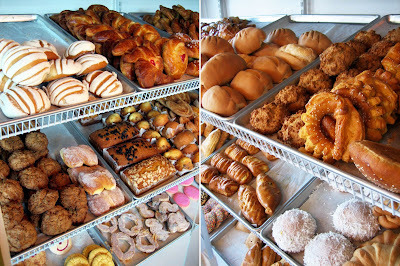 The panaderia stuff can't rival those you find in Anaheim and Santa Ana...actually, they're virtually identical. I can't tell the difference. The reason I wrote about them at all are because of those saltenas! So awesome. I was at Pho Hung Vuong over the weekend too! Yeah, you can't miss it from that angle. Definitely come in for the saltenas. But like I said to the other commenters, the bakery items are indistinguishable from other Mexican bakeries. That's funny. When I finally went to try Zon the other day, I saw this place newly opened and wondered who would be the first to review it... I was thinking of yelp! of course. But you beat me to it, so to speak. Glad to hear they have some good stuff, I'll have to check it out. You're right about raisins and beef in Filipino cooking. And we also do empanadas in a similar fashion as well. I'll have to add empanadas on my list of things to make! We got lucky this time. Actually, our intention was to get some sandwiches at Zon, but then, there it was...Rollie's. Wow! That's quite an order. And they've only been open for less than two weeks. Lookin' forward to your empanada post. If there's one thing I'd like your take on, it's how you seal the edges. Will it be crimped with a fork? Or braided with fingers? Can't wait. Hey Elmo - Only you could combine Sasquatch flatulence and a Panaderia in a single post.....amazing. I walked into there last week and everything looked great! We ate at Zon Baguette next door and was too full to get anything at Rollie's. Thanks for the reminder and we've gotta get back there when our stomach's are empty again! HA! I was wondering when someone would catch that part, about the fart. Glad it was you! Yeah, fortunately, we hadn't ordered anything at Zon yet, so we had a full stomach to work with at Rollie's! A nephew introduced me to your site and I am glad he did. I think I will come back for more. I have relatives coming over from afar and your mini travel guide will be a great help especially because eating is always part of entertaining. I won't have to guess anymore. Danger danger! Those places wreak havok on my panda-ish figure. You're welcome! And thank your nephew for me. Think what it has done to my formerly svelte Elmo physique. First time for me too actually! My husband, daughter & I have been there every weekend since it's opened. We have panderias by our house, but this place is different! We LOVE the saltenas!! The staff is very helpful since we don't know what anything is. It's definitely worth the drive for us. I WENT HERE THE OTHER DAY AND BOUGHT THEIR BREAKFAST BURRITO IN THE MORNING. IT WAS DISGUSTING! FLAVORLESS AND JUST DRENCHED WITH OILS. TO TOP IT OFF, IT TOOK THEM ABOUT 20 MINUTES TO MAKE IT. I DONT KNOW IF IT'S BECAUSE I CAME REALLY EARLY AND THEY USED THE PREVIOUS DAY'S INGREDIENTS, BUT THE BURRITO SUCKED! Glad you liked it. They've only been open for a month or so, and you're already a loyalist! If you got the burrito with the chorizo, it is very greasy, as chorizo often is...but then maybe you didn't because if it's chorizo, it should be spicy and salty, like the one I had. Sorry you had a bad experience though. One thing to avoid is their combo plates...very disappointing. the owners of this place hold a special part in my heart and i have talked to them for hours about the time and effort they put into making everything fresh. baked goods are done every morning, and all that is left is taken to a local church, boys and girls club, and other needed places. Not only is the food good but the atmosphere this place brings is very comforting. Along with the rareness of finding a place like this in Tustin, it is very rare at any restaurant that the kitchen it open for all to see, this shows how organized and clean they must be. they this is not just another place to just mas produce they truly focus on freshness and quality instead of quaintly. That's a bummer about the greasy breakfast burrito. I just came from there for my first visit. I ordered a tender beef taco (not carne asada), rice and beans. The owner was so sweet and the place smelled like heaven. I took it to go and it all melted in my mouth. I cannot wait to go back. They don't use lard and they make their own tortillas. Rollie's is special and I hope they can stay in business because there are very few places like this. This is the kind of business I want in Tustin. I tried their panaderias, and they're not identical- they're simply not as good as the ones I've eaten in Santa Ana. I tried five or six different kinds from this shop, and they weren't the worst I've had. But, certainly, nothing to write home about. I could understand talking up these panderias if there no were no other available options. But, dude, this place is so close to Santa Ana. If you just drive down a little bit further, you could have gotten the real deal. Had a ground beef saltena ($2.40) for the first time last night and just did not care for it because it was SO greasy! I like the empanada at Chimichurri in Santa Ana better..much more tastier and healthier and the shell was so flaky (prefer it this way than doughy like the saltena)! I haven't given up on Rollie's though. I will try something different next time.